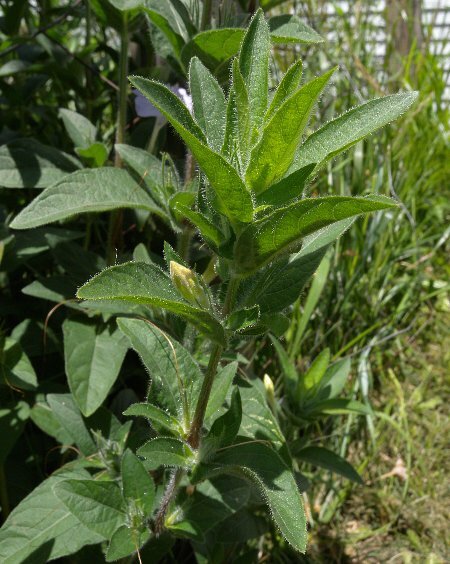 Description: This herbaceous perennial plant is about 1' tall, branching occasionally. The stems are light green and covered with white hairs. The opposite leaves are up to 2½" long and 1" wide, and broadly lanceolate, deltoid, or ovate in form. They are light green to green, with smooth margins, and are covered with white hairs on both the upper and lower sides. The leaves also have hairy petioles. The flowers have light lavender or light purple flowers that are funnel-shaped with 5 spreading lobes, and they are 1½–2" long and similarly across. There are usually fine purple lines that radiate from the center of the corolla; these function as nectar guides to visiting insects. The short-tubular calyx has 5 long linear teeth; it is green and hairy like the leaves. The flowers have no noticeable scent. A flower typically opens during the morning and falls off the plant by evening. The overall appearance of Hairy Wild Petunia resembles cultivated petunias, but they are members of different plant families. The blooming period occurs from early summer to late summer, and lasts about 2 months. The root system is fibrous. The dark seeds are fairly large and fall to the ground not far from the mother plant. Cultivation: It's quite adaptable, tolerating full or partial sun, moist to dry conditions, and practically any kind of soil. Under moist conditions with rich soil, however, this plant is unable to compete with taller, more aggressive plants. Disease doesn't seem to bother it. 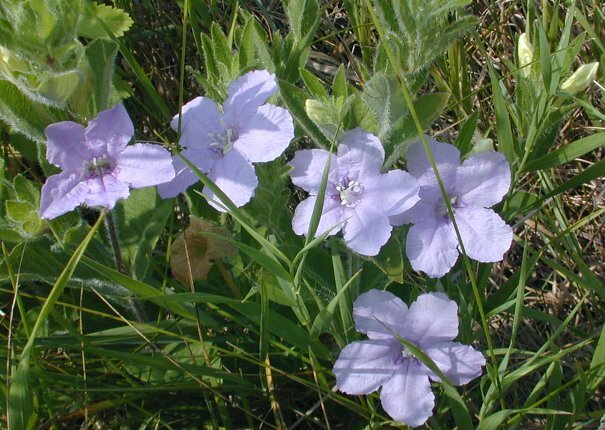 Range & Habitat: This native plant occurs occasionally throughout Illinois, but it is most likely to be absent in the NW counties (see Distribution Map). 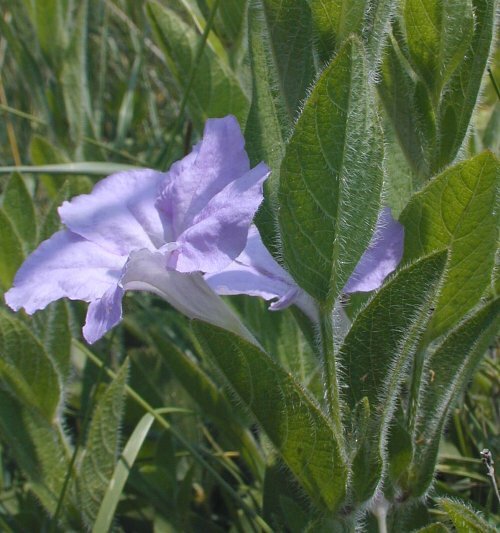 Hairy Wild Petunia occurs in mesic to dry black soil prairies, gravelly hill prairies, dry open woodlands, limestone glades, bluffs, sandy cemeteries, sand flats, and areas along roadsides and railroads. This plant is found in areas with poor soil and sparse vegetative cover, or it is found in disturbed areas of prairies with richer soil. In these areas, Hairy Wild Petunia occurs as scattered solitary plants or in small colonies of plants. Faunal Associations: Long-tongued bees are the most important pollinators of the flowers, including Anthophorid bees (Anthophora spp.) and leaf-cutting bees (Megachile spp.). The latter sometimes cut pieces from the corolla of this wildflower, which are used in the construction of brood nests. Short-tongued bees and Syrphid flies also visit the flowers, but they collect stray pollen and are not effective pollinators. The light color and funnel-like shape of the diurnal flowers suggest that they may be visited by day-flying Sphinx moths and Hummingbird moths, but apparently this has not been observed. It has been reported that the caterpillars of the butterfly Junonia coenia (Buckeye) may feed on the foliage of Ruellia spp. occasionally. Photographic Location: Photographs were taken at the Red Bison Railroad Prairie in Savoy, Illinois, and the wildflower garden of the webmaster in Urbana, Illinois. 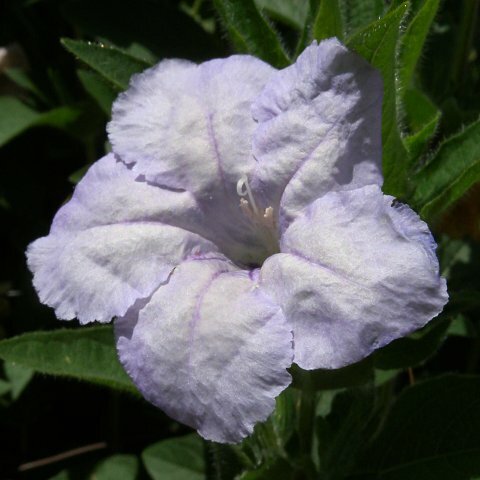 Comments: Because of its large and abundant flowers, the Hairy Wild Petunia is grown occasionally in flower gardens, particularly along borders, or in rock gardens. It's an attractive little plant. There is some variation in the shape and hairiness of the leaves, depending on the local ecotype. There are other Ruellia spp. with similar flowers that occur in woodland areas – they tend to be taller plants with less hairy leaves.